Do you love the Cracker Barrel? Recently they served the Cracker Barrel Mushroom Braised Pot Roast. It was a tender roast beef with succulent mushrooms. What makes this recipe special? It is the slow cooking of the roast; I also like that their mushrooms don’t turn into mush during the cooking process. The Cracker Barrel describes the roast as a USDA Choice chuck roast is topped with sliced fresh mushrooms, then slow-cooked in our mushroom sauce. I thought this was great to this roast beef recipe. This is a pot roast, so it is going to be cooked in juices, I think their choice of the chuck roast makes this one completely delicious because the meat is marbled giving you a lot of flavors. I also love that the roast makes it’s gravy while you are cooking it. Serve this with some mashed potatoes, and you have dinner.
. If you can’t find it, I would use a little beef base, or even add a beef bouillon cube to the cooking. The Cracker Barrel used white button mushrooms. I prefer the small portobellos, shiitake, or even a combination of white button mushrooms and the small portobellos. I think when you layer the flavors you get a better result. This recipe can be made either in a slow cooker, the oven, or my favorite cooking appliance, the Instant Pot. Anyone of these methods will do just fine. 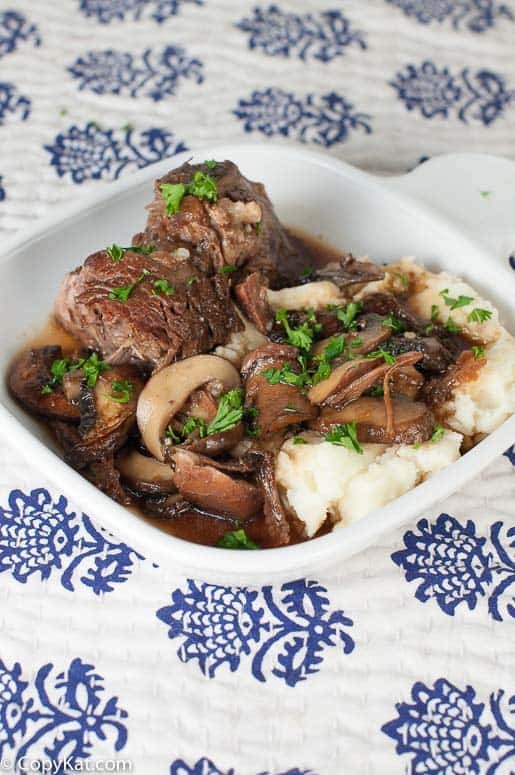 I hope you enjoy this recipe for the Cracker Barrel Mushroom Braised Pot Roast. If you like the Cracker Barrel be sure to check out these other favorite recipes. 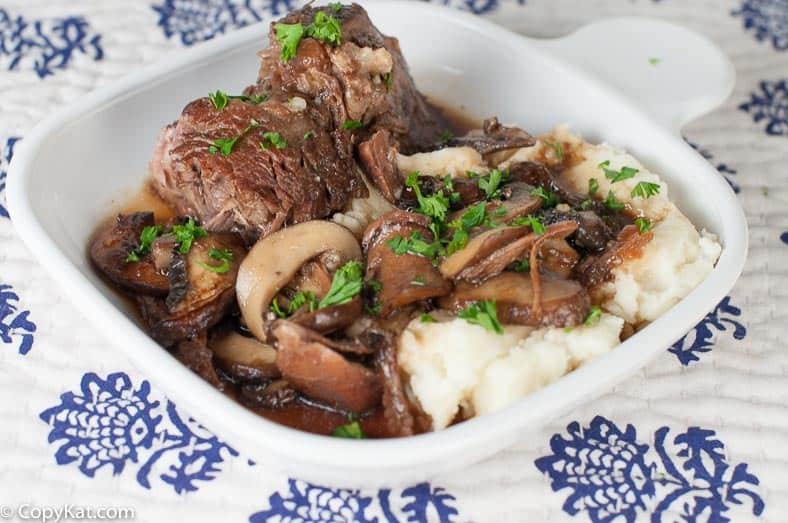 You can make a delicious Cracker Barrel Mushroom Braised Pot Roast at home. Season roast with salt and pepper. Add vegetable oil to the Instant Pot. Sear roast on all sides until brown. Add 1 chopped onion to the Instant Pot along with 2 cups of beef broth, and 2 tablespoons of Gravy Master.Use the meat setting button for 90 minutes. Allow the pot to release by using the natural release method. While the pot is releasing the pressure, naturally saute 1 pound of sliced mushrooms butter. Add 1/2 teaspoon of salt to the mushrooms while sauteing. When mushrooms are cooked through add to the roast. Season roast with salt and pepper. Add vegetable oil to the large skillet oven. Sear roast on all sides until brown. Add 1 chopped onion to the slow cooker along with 2 cups of beef broth, and 2 tablespoons of Gravy Master. Cook for about six hours on low. When the cooking is almost completed saute 1 pound of sliced mushrooms butter. Add 1/2 teaspoon of salt to the mushrooms while sauteing. When mushrooms are cooked through add to the roast. Season roast with salt and pepper. Add vegetable oil to the large Dutch oven. Sear roast on all sides until brown. Add 1 chopped onion to the Dutch oven along with 2 cups of beef broth, and 2 tablespoons of Gravy Master. Preheat oven to 350 degrees. Cook the roast for 30 minutes for each pound of beef. When you remove the roast from the oven saute 1 pound of sliced mushrooms butter. Add 1/2 teaspoon of salt to the mushrooms while sauteing. When mushrooms are cooked through add to the roast. This roast beef recipe was quite good and very tender made in my Breville pot, but no where near like Cracker Barrel’s roast beef. I despair of ever making roast beef like Cracker Barrel. I am so sorry to hear that you despair of ever making a roast like they do. I am sorry you disliked this, did you feel this was not comparable to their regular roast beef, or that it wasn’t a match to the seasonal mushroom roast beef that was on the menu a couple of years ago? I have made this a few times since eating the dish at CB this winter. Your recipe is amazing. I make it as is and comes out great. I have the Kitchen Boquet in my area. Thanks! We have a Brazilian Steakhouse in Napa and I loved their Black Beans and Pork, I am usually not a fan of black beans, but it was really good. Just a thought ….. This looks great. But where is the recipe ??? I do not see the recipe in this post. My wife actually ordered this dish at CB and it was great. I would like to attempt to recreate it but all I have is the video in this post. Any help would be appreciated. The post is back. I am sorry, for some reason sometimes the recipe disappears. Did you make the mushroom braised pot roast in a presure cooker. I have a wonderful automatic pressure cooker (not the old type that used to blow up when my mom used it….i have a fear of flyiing carrots to this day). Ate the instructions diffecent in any way? Sory for the typos….I have to deal with trmors. No problem on the typos. I made my roast in an electric pressure cooker. They are a little easier than the older ones. Did you want instructions for the older ones? If so, here is a link to a chart for the old stove top type pressure cooker. The cooking time depends on how the meat is cut. Would you be able to provide instructions for making this in the Instant Pot? Yes, the roast should cook for about 90 minutes in an electric pressure cooker. Mmmm. I like Cracker Barrel’s roast. Thanks for sharing! I kept looking at your roast recipe and left another comment. ???? You’ve got me drooling over roast and potatoes now. LOL! Mmmm, this roast looks good! I love Cracker Barrel’s roast. Have you ever had Rainforest Cafe’s roast? I love the way they serve it over mashed potatoes. Thanks for sharing your recipe! I have never had their roast, I will have to check it out. Do you offer a newsletter ? I couldn’t locate the sign-up on your website…. I do, I can sign you up if you like. A product filled with chemicals, corn syrup, salt. a couple of turnips and loads of fresh herbs. It is a product sold in the grocery store. It helps with flavor and browning of meats. This is looks yummy! got the stuff to make it tonight, I can’t wait. Thank you for your note. I did have an error in the recipe. I appreciate you took the time out to let me know. I have corrected the Crock Pot, and Oven directions. I too, love using a pressure cooker when I can. Thank you for checking out the recipe. You could also use Kitchen Boquet which I always put all over my pot roasts.